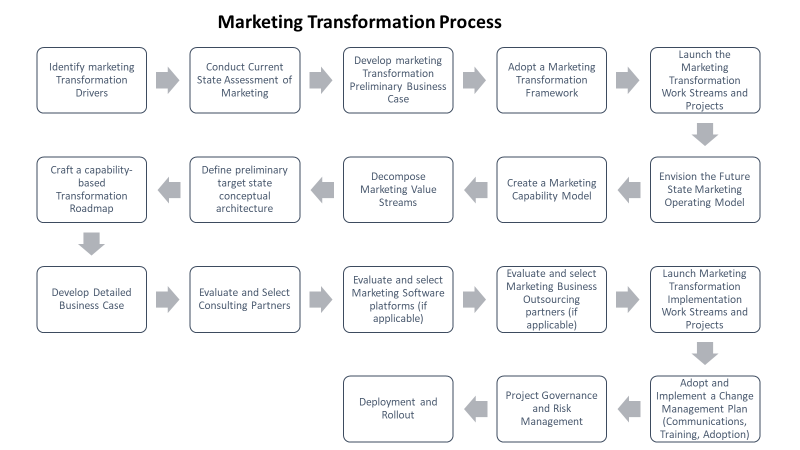 What is a Marketing Transformation Roadmap? A Marketing Transformation Roadmap is a step-by-step navigation to get your enterprise from the point of departure to the point of arrival, by taking a set of actions, implementing some activities and achieving some outcomes, in a planned and sequential manner. Marketing Transformation, as the word “transformation” implies, is more than just a band-aid to fix a process or a system issue. A true Marketing transformation is a result of strategic and operating model considerations with an impact on people, process, data, user experience, and of course, technology. Moreover, in today’s dynamic environment – where technology advances are driving business model changes, customers are demanding ever more, and the pace of change is accelerating – it is imperative that Marketing functions leapfrog from creators of ad copy to a holistic, demand generation function. There are several internal factors and external events that make a Marketing Transformation a strategic imperative. Familiar external drivers for Marketing transformation tend to be a new wave of competitors, decreasing the share of mind and share of wallet, rising customer expectations, technology advances, and changing business/revenue/channel strategies. Moreover, internal drivers for a Marketing transformation could be factors like lack of visibility into the marketing workflow, antiquated processes, lack of actionable data and metrics, cumbersome procedures, redundancy, and replication, etc. Before one can build a viable Marketing transformation roadmap, it is essential that the CMO (Chief Marketing Officer), the CDO (Chief Digital Officer) and their compatriots realize and acknowledge the need for Marketing transformation. It is crucial for the top management to distinguish ongoing operational and process improvements from the fundamental need to rethink. For example, continuous improvements, such as Kaizen, are normal evolution of the Marketing function. However, a reimagination of the operating model, the re-engineering of core processes, and the significant re-architecting of the systems are when a Marketing transformation roadmap is warranted. Once there is a realization that a Marketing transformation is warranted, the next step is to establish a core team and fund the initial efforts for creating the transformation roadmap. At this stage, what is needed are strategic thinkers and operational experts who can envision what’s “Next.” The transformation program is still at a conceptualization phase, not an execution phase. Based on the strategic imperative and internal drivers, document what are the key goals, objectives and desired outcomes you are striving for. Knowing these high-level objectives will help frame the context for the Marketing transformation roadmap. Documenting the current state of the marketing function can be a multi-dimensional effort. The critical thing to understand here is what depth do you need to go? If there is a consensus that the transformation is not about a step function improvement, but a leapfrog, then the current state may not be a material factor. In such a case, one can get away with anecdotes and interviews to summarize the current state. Alternatively, on the other hand, if the goal is to not to repeat the history and to understand the details and depth of the current state are valuable, it may require documenting current state processes, the inefficiencies, and bottlenecks. This exercise, while helpful, also will be time consuming and expensive. The current state of people analysis – competencies, capacity, etc. The next state process should be unencumbered by the current state systems, methods, and people. It should be a blue-sky picture of an ideal state. The ideal target state defines your point of arrival, and the current is your point of departure. The gap analysis shows how much of a chasm do you need to cross before you can reach your desired state. Understanding that there are alternative approaches to transformation and dispassionately evaluating the options is a crucial step in crafting a Marketing transformation roadmap. In addition to discussing the method, a high-level ROM (rough order of magnitude) estimates of cost, effort, and complexity would be valuable. Similarly, a high-level listing of potential benefit streams – qualitative and quantitative will provide a balance to the expenses. The recommendation from the project team should be based on several considerations – cost, effort, complexity, and the result. The recommended path should ideally comprise of a target operating model. A target operating model is a blueprint of the future state functions, processes, people and information as levers to accomplish the new business state. Much of this is based on high-level estimates and several assumptions, but that is what is typically the case in real life – decision making with much ambiguity. 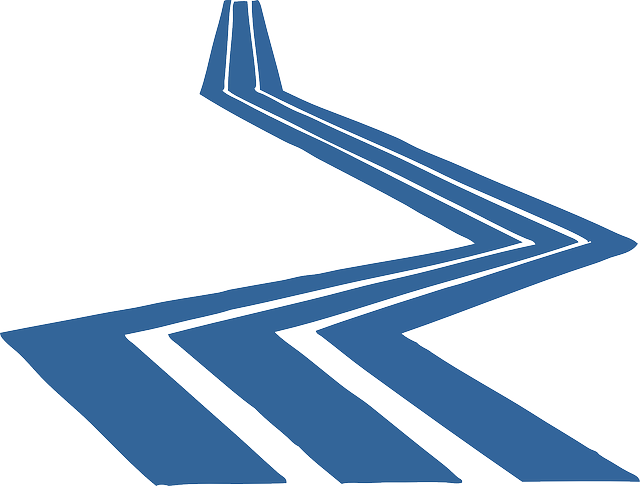 Craft a Transformation Roadmap: The detailed marketing transformation strategy and roadmap will typically consist of a comprehensive quarter by quarter activities, outcomes and milestones for the first 24 months, and then for subsequent years an annual phased roadmap items. Typically, the transformation roadmap will comprise of high-level work streams and phases so that incremental delivery is possible. What about the business case? A business case – both qualitative and quantitative – may be necessary in three stages. Stage one shall be the initial funding to evaluate the value and viability of a transformation. Stage 2 business case is during the recommendation of the transformation approach. Stage 3 business case can be at a workstream level. Of course, a transformation roadmap is a strategic deliverable. The real work will start soon after that on various projects and work streams. That is out of the scope of this article. 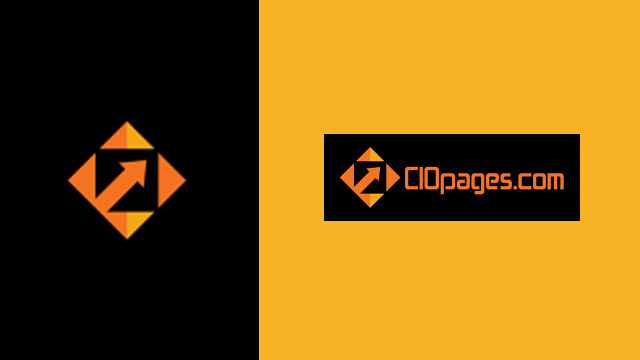 For assistance with developing a marketing transformation strategy and roadmap, please consult CIOPages.com. Or please consider the Marketing Transformation Toolkit.